Spot it! 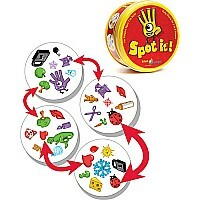 is the mind blowing matching game for every generation. The first thing to know is that out of the seemingly random collection of eight symbols on each card, you will always find a single match between them. 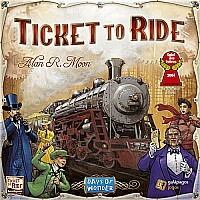 It's fast paced and frantic fun as you try desperately to find a match before your opponents. Don't be fooled; a match is easily hidden in the array! Every card combination tests your tiger - like reflexes and getting beat to the punch by another player only fuels your fire. 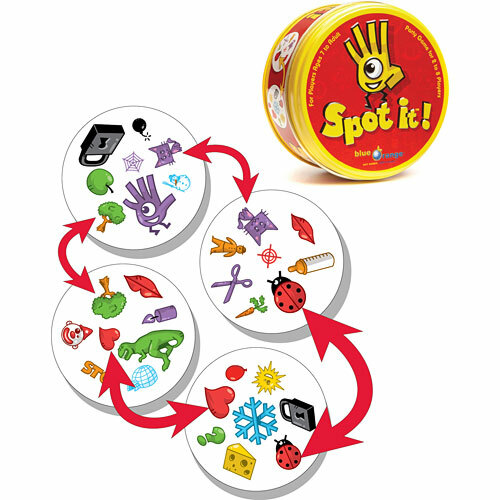 With no - brainer rules and five game variations, Spot it! has won the hearts of millions. Spot it! develops visual perception and matching\r\nskills. It supports quick mental processing and\r\nsharpens cognitive skills in a fun atmosphere.\r\nThe symbols are universal and easy to remember but the variety of imagery will challenge any eye.